Older children are less trusting of news on social media than from other sources and use a range of measures to separate fact from fiction, Ofcom research has found. More than half (54%) of 12- to 15-year-olds use social media platforms such as Facebook and Twitter, to access online news, making social media the second most popular source of news after television (62%). The news children read through social media is provided by third-party websites. While some of these may be reputable news organisations, others may not. But many children are wise to this. 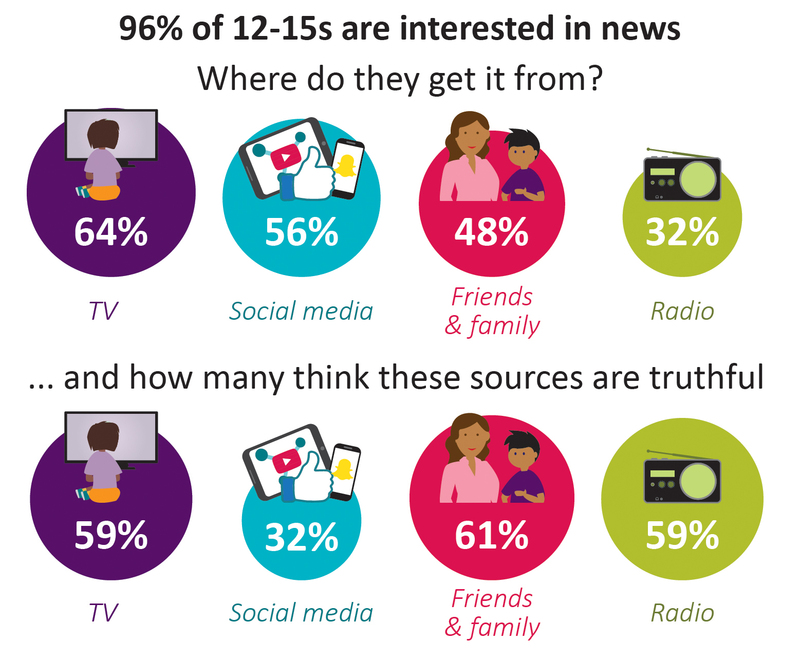 Just 32% of 12- to 15-year-olds who say social media is one of their top news sources believe news accessed through these sites is always, or mostly, reported truthfully, compared to 59% who say this about TV and 59% about radio. 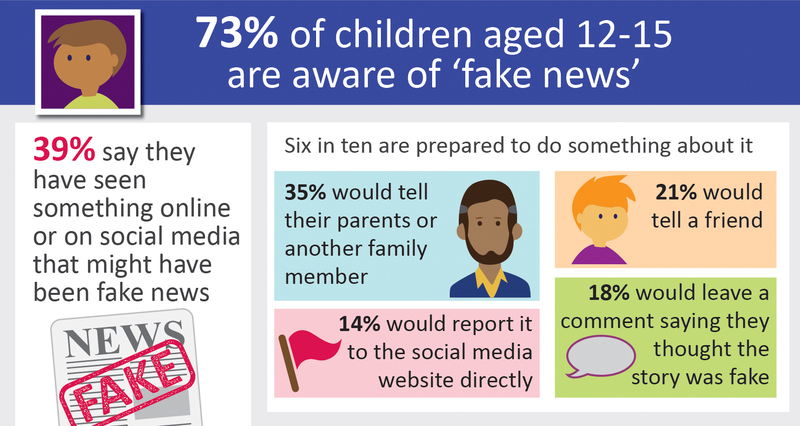 Some 63% of 12- to 15-year-olds who are aware of fake news are prepared to do something about it, with 35% saying they would tell their parents or another family member; 18% would leave a comment saying they thought the news story was fake; and 14% would report the content to the social media website directly. But some children still need help telling fact from fiction. Almost half (46%) of 12-15s who use social media for news say they find it difficult to tell whether a social media news story is true and 8% say they wouldn’t make any checks. More children are using the internet than ever before; 92% of 5- to 15-year-olds are online in 2017, up from 87% last year. More than half of pre-schoolers, 53% of 3-4s and 79% of 5-7s, are online - a 12% rise on last year. Much of this growth is driven by the increased use of tablets. There is low awareness among parents of minimum age requirements. Six in ten parents of children who use Facebook (62%), and around eight in ten parents of children who use Instagram or Snapchat (79% and 85%) either didn’t know there was an age restriction, or gave the incorrect age. Meanwhile, many parents choose not to apply minimum age limits. Find out more about protecting children when they’re online. But some 8- to 15-year-olds disagree. One third (35%) of 8-11s who watch TV say that not enough programmes show children that look like them; while 41% of 12-15s say too few programmes show children living in their part of the country. 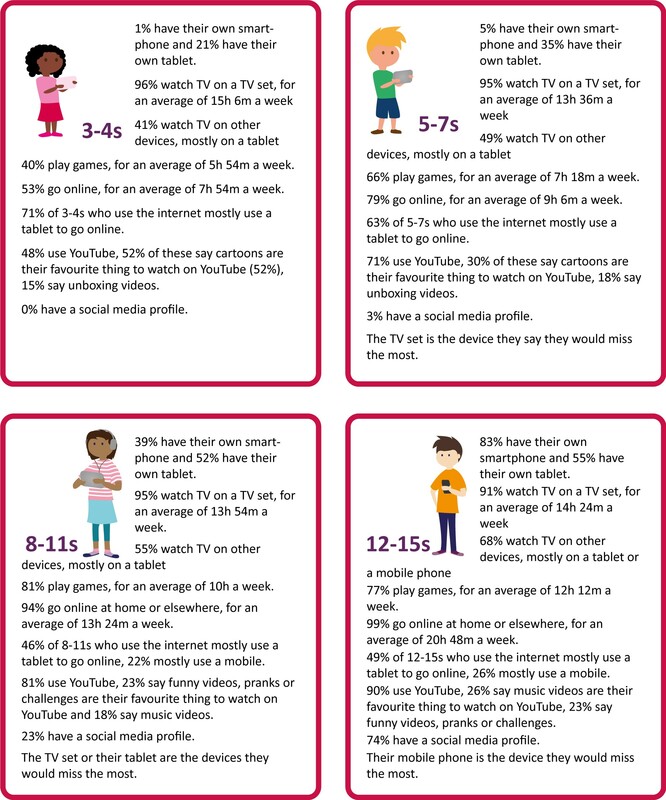 Building on this research, Ofcom has today launched a Review of Children’s Content. We will examine the range and quality of children’s programmes across TV broadcasters and content providers, and highlight any areas of concern.